Happy New Year everyone! I hope you enjoyed the holidays and had lots to eat and share. I was in California for a week, but now I’m back and ready for a new year of Semi-DIYing. 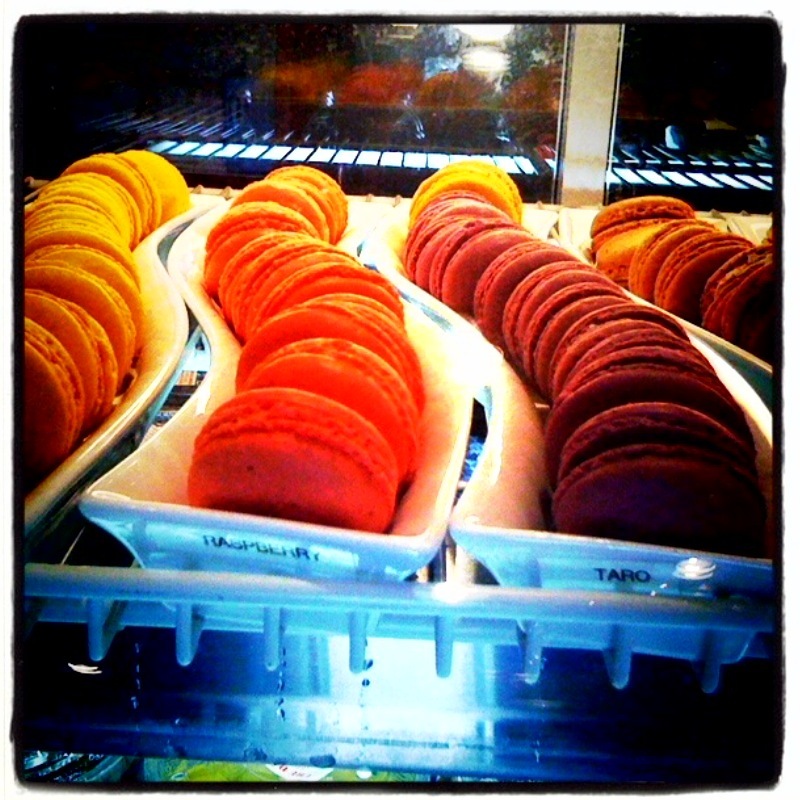 🙂 (BTW, the thumbnail is of amazing macarons that I had to bring back from Brodard—they even make taro and durian flavored!). 1. 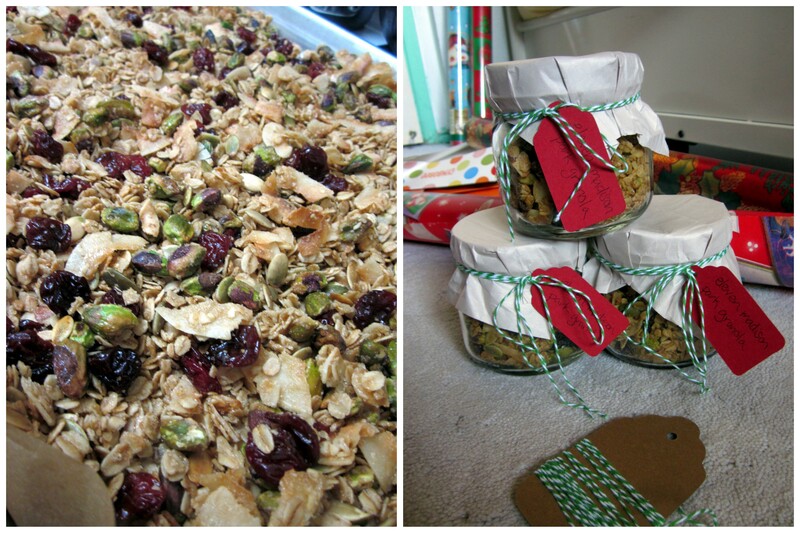 Eleven Madison Park Granola – recipe from the NY Times. This was quite easy, but the ingredients (i.e. sour cherries, pistachios) can be pricey. After going to three grocery stores searching for half-pint mason jars a day before my flight, I had to give up and go with stout pint mason jars. This recipe filled four stout pint mason jars. I wrapped them with packaging paper, baker’s twine, and a tag. 2. Chalkboard Mugs with Microwave Coffee Cake. 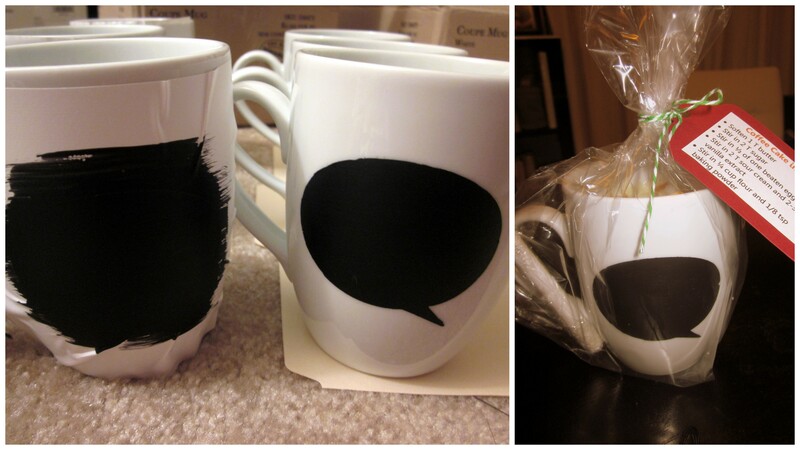 I bought black chalkboard paint from Home Depot and coffee mugs from Cost Plus World Market. The template was made by cutting out Contact paper using my Cricut. Because the mugs were curved, the Contact paper didn’t stick on smoothly and the painted lines didn’t come out perfectly. 😦 This was another easy project but time consuming (the first coat had to dry for at least four hours before adding the second coat and chalk couldn’t be used on the paint for three days). I also had the ill-conceived idea to make eight of the Cup of Coffee Cake in the chalkboard mugs right before my flight. I didn’t consider how difficult it would be to transport eight mugs along with a pie on a three-hour flight. But there was a lot of ♥ put into those mugs and I hope my friends enjoyed them. 3. 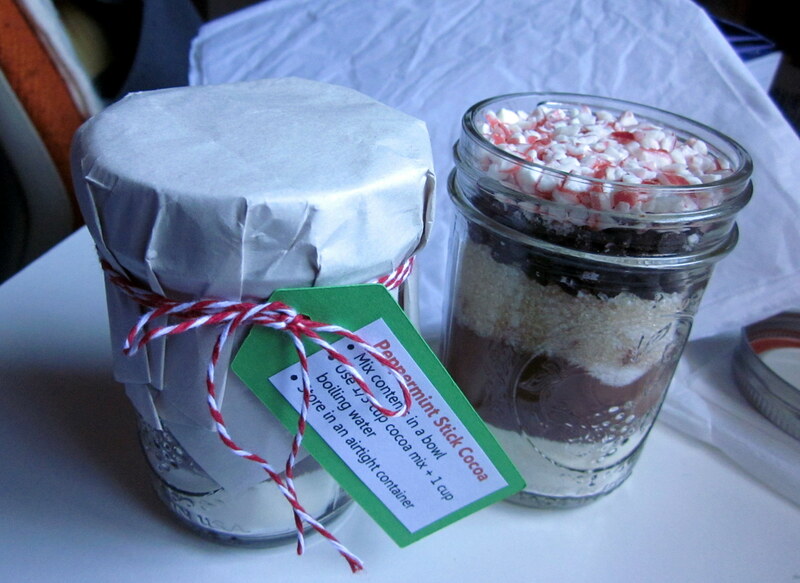 Peppermint Stick Cocoa Mix – this was the simplest project and looks quite pretty in the jar. I also previously posted this as a good hostess gift. 4. Felt Flower Hair Clips – I made some felt flower hair clips using this tutorial from Infarrantly Creative for some babies in my life. The clips also doubled as gift toppers. Of course, I forgot to photo-document what I created, but the tutorial covers things well. For the new year, I’m going to try to accomplish some of last year’s goals including making my own bread and cooking with a whole live fish. Maybe I’ll take up a new craft like crocheting or embroidery. Yay for fresh beginnings! This entry was posted in Crafts, Food, Gifts and tagged Chalkboard mugs, Cocoa, Felt flowers, Granola. Bookmark the permalink. 2 Responses to Hello 2012! Linda, we should totally get together for a craft day!!! Yes definitely! Let’s do it in Feb. when things are a bit calmer.